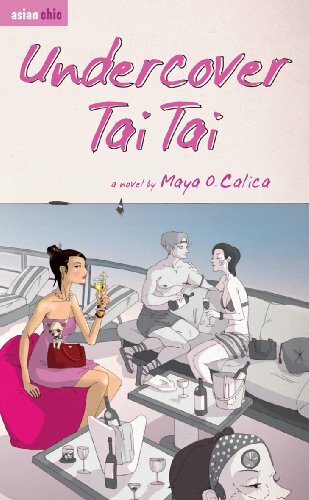 I loved Maya O. Calica’s The Breakup Diaries so I was ecstatic when I discovered that she has another book out. Undercover Tai Tai was initially published by Marshall Cavendish under its Asian Chic Series, which is good because that means it’s internationally available. Locally, it’s reprinted by Anvil Publishing and is available for P150. Amanda Tay thinks she is losing her mind or starring in a surreal film by Stanley Kubrick. You would be too if you’ve been knocked unconscious on your first date in 27 years only to awaken in a beautifully appointed apartment that looks like a page from Tatler Magazine. Last time she checked, the film student-turned-book researcher was renting a tiny room in a flat, so what was she doing sprawled on a king-sized bed with 600-thread count bed sheets and a ponkan-sized bump on her head? The Undercover Tai Tai is a hilarious journey of a young woman who, while pretending to be someone else, makes connections with her past and discovers parts of herself that she never thought existed. I was expecting to love this one but sadly, that didn’t happen. I guess mostly because I was expecting something along the lines of The Breakup Diaries, a believable story of a young girl searching for love. Instead, I got an action-adventure type of story that required suspension of disbelief right from the start. Don’t get me wrong, Undercover Tai Tai is a lot of fun, it just didn’t work out for me. Amanda Tay is used to not being noticed by anybody. She’s been in Singapore for a couple of months and she doesn’t really have any friends. Even her flatmates can’t remember her name right. Everything changes when she gets drafted to work as an undercover agent to discover the whereabouts of a missing tai tai. Tai tais are the elite socialites of Singapore – Amanda’s mission is to pretend to be one of them to infiltrate their circle. While I’m thrilled that Filipino authors are getting international deals, I wasn’t that enamored of this one. I wasn’t able to connect with any of the characters and I felt like the story wasn’t really plausible. The events were so sudden and there wasn’t enough build-up to make them realistic. I think the author was going for something that would read like a screenplay of a movie. Feel free to give it a try though because some of you might like it more that I did. Read this if you’re interested in the premise and you want something lighthearted. Some other chick lit books by Filipino authors that I enjoyed more than this are Fairy Tale Fail by Mina V. Esguerra and Amazing Grace by Tara FT Sering. ← Why are Aussie books so expensive? I finished this earlier and enjoyed it, but you’re right, it’s not your usual chick lit. And yes, it does feel more like a movie. I think I got annoyed at them for calling each other Agent A, B, O, F. Seems like a waste of saliva saying Agent, and it didn’t feel natural. The entire book didn’t felt natural! Haha I mean c’mon, a girl gets drafted to work as an undercover agent just like that? I hope the author writes another book soon because I really liked her old one.